Discussion in 'Meetups & Events' started by wannagofast, Aug 14, 2018.
wannaGOFAST - Florida 1/2 Mile Runway Shootout - October 20-21, 2018!! 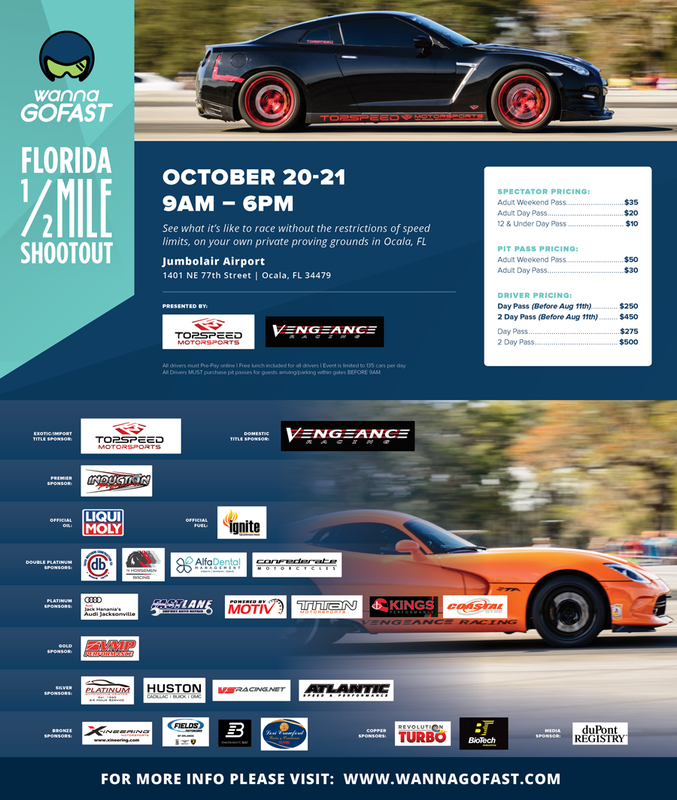 wannaGOFAST.com is proud to present the Florida 1/2 Mile Shootout!! This incredible 2-DAY event will be held on October 20-21, 2018 at the Beautiful Jumbolair Airport (www.jumbolair.com) located in Ocala, FL nestled in the Horse Capital of the World!! Come join us for 2 FULL DAYS of, side-by-side, HALF MILE racing at this rare and exclusive location. All of our participants will be given a chance to take their vehicle’s Top Speed down Jumbolair’s private 7550 ft runway and race door-to-door against the competitor of their choice!! See what it’s finally like to race without the restrictions of speed limits, on what is basically your own private proving grounds in Ocala, FL!! This event is limited to only 150 cars per day and is sure to sell out quick!! So register today and we promise to make your automotive DREAMS come true!! The "Official" Host Hotels are the Hilton & La Quinta of Ocala. Pricing for the Hilton will start at $129/per night and $119/per night for the La Quinta. CLICK HERE to Reserve Your Room at the Hilton of Ocala. If you would prefer to stay next door at the La Quinta please call them at (352) 861-1137 and tell them your with the "wannaGOFAST" group in order to get the $119/night rate. Driver Registration Will Open On August 10, 2018 at 8AM EASTERN TIME! !